Congratulations to the Claremont High Class of 2018. Michael Negrete Photography is your senior yearbook portrait photographer. Michael Negrete has been a boutique fine portrait studio in Claremont for over 18 years. Michael specializes in creative and emotional portraits. He loves to tell each individuals story and reveal their true personality in a work of art. He is especially adept at making people feel comfortable so he can capture their own unique beauty. This FAQ is to help answer the many questions parents and seniors have regarding the yearbook, cap and gown, studio and location senior portraits. Do I have to come to Michael Negrete Photography for my yearbook portrait/senior portrait? -Yes you do have to come to us to be in the CHS yearbook. The yearbook requires consistent portraits of the best quality and of course there is a deadline. We take the yearbook portrait very serious and hope to make something that you are proud to display yourself. We also offer many options such as cap and gown, letterman, in studio or on location sessions to accommodate your needs. All of it is discounted just for the families of CHS. What should I wear for my yearbook portrait? -Your school requires tuxedo for boys and a black velvet drape for girls. This will be provided by Michael Negrete Photography. -Girls may want to wear and or bring a tank top with straps that can be pulled down. Girls can also bring necklaces or earrings from home and must arrive make up and hair ready. -Boys may want to bring and or wear a white t-shirt to wear under the tuxedo. What is a portrait creation session fee and what does it include? -A portrait creation session fee is a fee for the photographers time to create the portrait and does not include products. Michael guarantees his session fees 100%! If your not satisfied he will re-create the portrait or return the session fee with no hassle. You will be able to view your yearbook, and any in studio portraits; immediately following your session. If something isn't just the way you want it we often go back into the studio to get exactly what we want. This process ensures that we create portraits you will love. How much are the portrait creation session fees and how long are they? Portrait Creation Session fees must be paid when you schedule your appointment. We can easily process your ATM/credit card over the phone while we schedule you. You are also welcome to come into the studio and pay with check or cash and book in person. If you have more questions about which session suit your needs please call the studio at 909-625-3138. To book a session call the studio at 909-625-3138, we will explain all of the options available and answer any questions you may have. Please have payment method ready. You may self-book online with this link http://bookingcloud.net/michaelnegrete There are a select number of appointments available at specified times (July - October) and you may and pay your session fee online. Please call 909-625-3138 to cancel 24 hours prior to your appointment. Guests are limited to one appointment at a time. Existing appointment must be cancelled to reschedule an appointment. Session fee is transferable/refundable with a 24 hour notice, otherwise it is non-refundable. The length of your photo session depends on the session option you choose (variety of outfit changes, portrait styles, poses, etc.). We count on our guests arriving 15 minutes prior to appointment for check in. In all fairness to all of our guests, we may have to reschedule an appointment if you arrive 15 minutes late to a scheduled appointment. For the best senior portrait we encourage parents to come with the student to view and order the portraits immediately following the session. You will have a personal viewing session with help from a portrait consultant and see your portraits on a large screen. We will show you all of the best images and you will be able to place your order at this time. You can sit comfortably on our couch and view your amazing portraits immediately after you take them! We will place your order the same day. No need for proofs or return visits. How do I pay for my senior portrait order-can I setup a payment plan? We accept all major credit card, cash or check. We have a 2 pay or a 3 pay payment plan available: 50% down at time of order, remaining balance may be paid in 1 or 2 more installments. Orders with payment arrangements or unpaid balance are not produced until final payment is received, and will be delivered 3-4 weeks from the final payment date. Once an order is placed, or payment arrangements and or deposits have been made, all payments are non-refundable. When will I get my portraits? Portrait orders are completed within 3-4 weeks of final payment. You must come to the studio to pick up your portrait order. Who gives my picture to the school or yearbook? -We do. 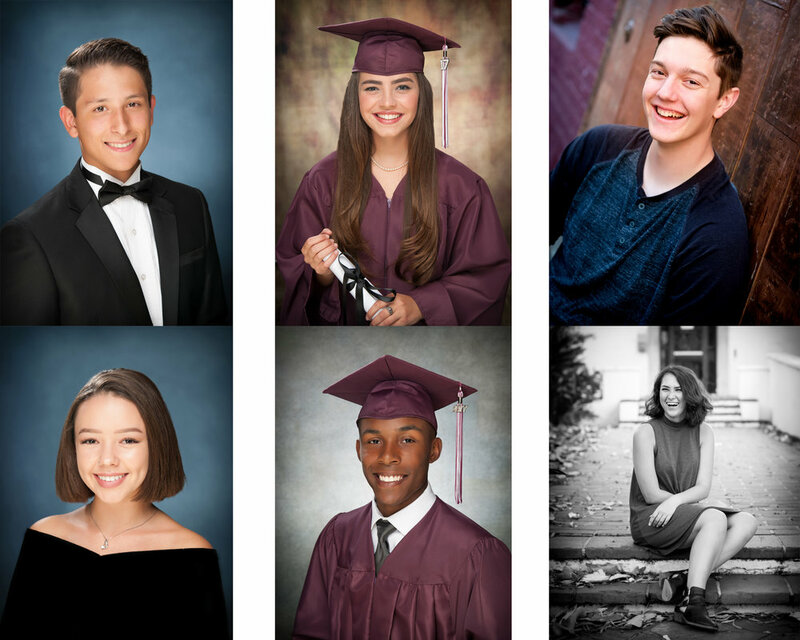 You will select your yearbook image during your portrait session and we will ensure it gets to the CHS yearbook staff by their senior portrait deadline. Minimize patterns on outfits, let the focus be on you! Matching shoes and/or socks for full length poses. Must come hair and make up ready and you can bring hair supplies (for touch-ups only). Check your outfits for wrinkles, it will show in the portraits. Limit your exposure to the sun for a few days before the session to avoid sunburns and tan lines. Tan lines will show in your portraits. Avoid getting a new hairstyle or cut before your session. Instead, select a comfortable style you know looks good on you. Do your hair and make-up before you arrive.